That they belong to the Society of Latter-Day Saints, commonly called Mormons, that a portion of our people commenced settling in Jackson County, Missouri in the summer of 1831, where they purchased lands and settled upon them with the intention and expectation of becoming honoured citizens in common with others. The injustices of Missouri are then outlined in three legal-sized pages of small script, as is contained in History of the Church and elsewhere. The tarring and feathering of Bishop Edward Partridge and Brother Allen, the mob bearing a red flag and declaring extermination to the Mormons if they didn't leave Jackson County, the breaking in of the store of A.A. Gilbert, mob destruction of property, the move to Clay and other counties, the voting scandal of August of 1838, the death of David W. Patten and some eighteen others, the extermination order, and the flight from Missouri are all detailed. Alonzo P. Raymond and his father, Pearis Raymond both signed this petition. They are listed as being in “Ward 3, page 11”". According to the “LDS Vital Records Library” Alonzo was baptized on February 7, 1846. I think this is an error because he was sealed to his first wife, Clarinda Cutler, in the Nauvoo Temple on that date. The LDS Vital Records Library also lists him as being in the 14th Quorum of Seventies in Nauvoo. In consequence of revelations received by their Prophet and colonizer, Brigham Young, the exodus began in early February 1846. 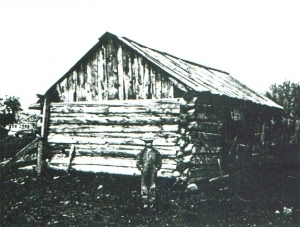 After Sugar Creek, Richardson Point, fifty-five miles west of Nauvoo, near a branch of Chequest Creek, and reached by Brigham Young on the 7th of March, became headquarters, and the camp remained at this place until the 19th of the same month, as heavy rains made the roads and swollen streams impassable. The next encampment was on the Chariton river where the leader established his headquarters on the 22nd of March, and remained until the 1st of April. Thence to an encampment on Locust river, reached by Brigham Young on the 6th of April. Garden Grove, so named by the saints, was made headquarters of the camp on the 25th of April, about one hundred and fifty miles from Nauvoo. Mount Pisgah, so named by Parley P. Pratt, became headquarters on the 18th of May; and on the 14th of June, Council Bluffs, on the Missouri, was reached and became headquarters. The first encampment here was made in the river bottoms, but at the suggestion of the leader the camp was moved back on to the bluffs overlooking the river both because they could there obtain spring water, and be a little further removed from the Omaha Indians, living in the bottoms. While at Council Bluffs, Alonzo became afflicted with what the doctors said was an incurable disease. He became very despondent over this diagnosis and while sitting down to rest on the side of a road after walking a short distance, he was approached by Heber C. Kimball who, putting his hand on his head, inquired what was troubling him. He told Mr. Kimball of his illness. Mr. Kimball asked why he did not join the Mormon Battalion. This question, of course, seemed to Alonzo to be very foolish in view of his physical condition and so expressed himself. Mr. Kimball told him to enlist and promised him that he would recover and be able to make that eventful march. Alonzo accordingly, enlisted in Company “D” and after a few days, during which time he rode in a wagon, he was able to take his place in the ranks of the infantry and the promise was literally fulfilled. When he reached California he was a strong and vigorous man. One day as the troops marched along he noticed a comrade who had crawled under a bush unable to go any further. Since he could not give any help then, he waited until camp was reached when he quickly filled his canteen with water and was able to reach his fallen comrade in time to save his life and bring him into camp. About eleven a.m. the people began to assemble under a bowery, about twenty by forty feet, in the rear of Father Morley's wagons. Prayer by Elder Orson Pratt. At 12 o'clock noon Pres. Brigham Young arose to explain the object of the meeting to tell of our location on the other side of the river, and our arrangements for living. President Young said, We are in two companies, about six hundred wagons. We give the brethren the privilege of living by themselves, and of attending their own herds; but if they get into difficulty, they must not come upon us for help. We shall adopt the law of liberty, and all who live up to it will enjoy all the liberty they can ask for, not infringing upon the rights of others. The principal object of our coming over, it to induce the people here to unite with us in the principles of self preservation, which includes all business matters pertaining to our present salvation. It is the invisible hand of the almighty that is favoring Israel. I will tell the people the people here what to do with the means received and if they fail to do it, we shall be released from our obligation to look after them. There are no people under heaven, of our acquaintance, who would have entered the army under the circumstances our people did. The Bishop and council here will do you the favor of assisting you in expending your funds, and the privilege of waiting on you till we get you where you want to go. I will warrant that you will get double the goods for your means by obeying counsel to what you would were you to have the expending of it to be raised by Jonathan H. Hale and Daniel Spencer. While the High Council retired a few moments, Orson Pratt read a list of letters remaining in the Nauvoo post office, that they might be sent for on the morrow. Meeting closed. The presidency and company rode on to the Bluffs, near Mosquito Creek, Dr. Willard Richards excepted; he spent the afternoon in paying small sums mostly to sisters to give them immediate relief. Mr. Williams Camp took all his money to the amount of Twenty Dollars, notwithstanding, Dr. Richards advised him to leave his money in the hands of the brethren according to counsel. Monday August 24 Near Mosquito Creek. Pleasant morning. Dr. W. Richards stayed at Ira Oviatt's and was called up by Pearis Raymond who took twenty dollars for the wife of Alonzo P. Raymond who was present, and wanted all her money as she was capable of taking care of it herself. (She was apparently living with her parents at the time). Elizabeth Pettigrew wanted all her money as she was capable of taking care of it herself. Elizabeth Pettigrew wanted forty dollars. She said she could take care of it herself but the money was sent to Harmon C. Cutlerwho was not present to receive it, but had counseled her to take all her money. Forenoon. President Brigham Young, Elder Heber C. Kimball, Orson Pratt, Wilford Woodruff, and Geo. A. Smith visited at Henry W. Miller's who had purchased the improvements of an Indian chief (subsequently called Kanesville) Dr. Willard Richards and Amasa M. Lyman arrived at noon, when we dined upon green chord, cucumbers, succotash, etc. After dinner all ate heartily of water and musk melon. About three, the company left, taking the remainder of a load of melons for the sick and arrived at the liberty pole, visited at the tents of Brothers Hunter, Wooley and Phineas Richards and distributed melons. Dr. Richards visited Sister Jane Richards, wife of Franklin D. Richards, who was sick. Alonzo left with the Mormon Battalion on 16 July 1846. His wife's step grandfather, David Pettigrew also joined the Battalion. He was the oldest member of the battalion at 55 years old and was named the Battalion Chaplain. He was known as “Father Pettigrew”. Clarinda had a brother, James Phineas, who also joined. Clarinda Cutler's mother, Susannah Barton Cutler died 21 Nov. 1840 and was buried at Nauvoo, Illinois. Her father, Harmon, married Lucy Ann Pettigrew 29 Aug. 1841 at Zarahemla, Iowa. Lucy Ann Pettigrew's father, David, is listed as being in a Stake Presidency called the “Zarahemla Stake” John Smith was the President and the other counselor was Moses Nickerson. Harmon and Lucy Ann had children born in Council Bluffs, Iowa, in 1844, 1847, 1849, 1852, 1853 (Jan.) And then a daughter, Matilda, is listed as being born on 2 Jun 1853 in West Jordan, Utah. (Obviously, a problem here with the records.) They stayed in Council Bluffs, Iowa, until Alonzo was able to return from the Mormon Battalion March and come and get them. Two days after the battalion arrived from California, Alonzo P. Raymond and David Pettigrew, along with thirty-two men from the Hancock-Sierra company, whose families were not in Salt Lake Valley, left on October 18, 1847, to go east. They reached Fort Bridger in a severe snow storm and learned the supply of flour they had planned to purchase had been bought by emigrants going to California and Oregon. While at Fort Bridger, Luther Tuttle bought a buckskin shirt from an old Indian woman, and it was both a shirt and a coat on the cold journey. They killed two buffalo bulls before reaching Fort Laramie and jerked the rest of the meat. They ran out of flour they had brought from Salt Lake Valley and existed on buffalo, beef, small game and an elk. The supply situation - no flour available - was the same when they reached Fort Laramie on November 10th. Captain Lytle bought one pound of crackers for twenty-five cents. The trader advised them not to kill any more buffalo, for it would offend the Indians. Twelve miles after leaving Fort Laramie, they found an Indian trader on the south side of the Platte River. Some of the men crossed over and bought one hundred pounds of flour for twenty-five dollars. With five hundred miles to go, they decided to use the flour (about three pounds per man) to only make gravy or thicken soup. They ran out of meat in seventy miles. Since there were many buffalo around, they decided to kill them as needed for food and risk upsetting the Indians. They killed a bull and a calf. While skinning the bull, they saw smoke and discovered Indians on the opposite side of the river from where they were. The men discussed what to do with the meat. Captain Allred said it would be useless to try to flee because of their worn out animals, so it was decided they would do nothing. They acted casual as they dressed the meat and returned to their camp on the river. The Indians disappeared after dark without molesting them. One hundred fifty miles below Fort Laramie the men encountered a snow storm that left twelve inches of snow. From here to Winter Quarters, about 350 miles, they broke trail through snow from one to two feet deep. Once again, two groups traveled some distance apart. One was led by Pace the other by Lytle. Lytle's men found the head of a donkey. It was supposed to have belonged to Sergeant David P. Rainey. Captain Allred took an axe and opened the skull and he and his comrades had a supper of brains. Near the same point, Martin Ewell opened the head of a mule also killed and left by Captain Pace's company, with the same results. When the Pace company arrived at Loup Fork River, several of the weakest horses drowned while trying to cross the river. They saved the carcasses and ate the drowned horse meat. The Lytle group caught up with Pace's company at Loup Fork just as Pawnee Indians were threatening to attack Pace's men. The two groups of armed men apparently caused the Indians to leave without attacking. They ate the last of their food, which consisted mainly of rawhide “saddlebags” they had packed their provisions in from California. Their next food was a young mule of Captain Lytle's that gave out. The cold became so extreme that the Loup Fork River began to freeze over. They had to wait nearly a week for the floating ice to get solid and thick. It was here that Abraham Hunsaker, in the hope of procuring corn from an Indian field across the river, took his frying pan full of coals from the fire and started across the ice and went under, frying pan and all. He poured the water off the coals in an attempt to save his fire. The fire was his main concern. Abraham quickly slid the frying pan across the ice to the river bank and then began his fight to get out of the freezing water. He finally reached the opposite shore, almost frozen. There he saw in front of him an old rotted stump of a tree he felt Providence must have provided. He gathered slivers from the stump, laid them over the coals in his frying pan, which showed no signs of life. He blew until his breath was almost exhausted; he rested and then he blew again. Finally he saw a faint glow among the coals and soon had a roaring fire. He dried his clothes and warmed himself. Later he filled his frying pan again with coals and went into the Indian corn field. He saw no Indians for which he was thankful. By diligent searching, he succeeded in finding a few ears of corn, enough for a feast as it seemed to him at the time. This he carried to an abandoned Indian wickiup, where he renewed his fire and parched the ears of corn. He ate until he was satisfied. The cold continued so intense the river finally froze over and Abraham returned to his group, to be welcomed by his companions, who were near death from starvation and the cold. They had given him up for dead. The corn Abraham carried to the men eased their hunger enough to continue. On the morning of the sixth day of waiting, the weary traveler decided the ice was strong enough to hold them. The crossing was treacherous with the ice cracking, but all reached the other side safely. From this point on the Pace and Lytle groups traveled together. During the last ten before they reached Winter Quarters, the only food they had was mule meat Captain Lytle had saved to be eaten without salt. They arrived at the Elk Horn River December 17, 1847. Winter Quarters was only thirty miles away. Alonzo after the Battalion March. The next morning they left early and arrived in Winter Quarters about sundown on December 18th. They had made the journey from Salt Lake Valley to the Missouri River in two months. Some of the company found their families in Winter Quarters, while others were in Council Bluffs or Mt. Pisgah. The soldiers, although respectable, were unavoidably dirty and ragged, yet they found a warm welcome from their people and Mormon authorities. Their four-thousand mile journey was over. After a short stay in California he (Alonzo) received his discharge from the army and with others made preparations to join their families in the valley of the Great Salt Lake. This journey was not made without subjecting them to great dangers and hardships. Upon arriving in Salt Lake he found that his family had not yet come with the company. He therefore set out at once to join them at Council Bluffs, Iowa. (For details of the trip to Council Bluffs see footnote 21) He found them all well but anxious to be on the way across the plains. The next year he brought his family over the memorable route and arrived in Salt Lake City in 1848. Here another child was born (Susannah). They then moved to West Jordan where another child (Harriet) was born. From here he moved to Lehi where he lived for some time. “Alonzo Pearce Raymond was born at Bristol, Vermont February 14, 1821, a son of Pearis and Rebecca Pearce Raymond. He was the first member of his family to join the LDS Church, and after his baptism he went to Nauvoo to be with other members. He married Clarinda Cutler in Iowa. Suffering ill health, he was assured by Heber C. Kimball that if he joined the Mormon battalion he would make the march to Mexico and be in good health. He made the march and after his release in California, he and his friends set out for Utah on foot. They nearly starved in the Nevada desert, but finally arrived in Salt Lake City in 1847. His family had not come with the first pioneers so he set out at once to rejoin them in Council Bluffs. In 1849, he brought his family to salt Lake City, where they lived until the fall of 1851 when they moved to the east side of the Jordan River. They were the first settlers of what is now Midvale. Clarinda Cutler was born in Amboy, New York in 1827 to Harmon and Susanna Barton Cutler. When they crossed the plains in 1849, she carried their first child in her arms. (Mary Elizabeth) Her second child, Susannah Rebecca, was born in Salt Lake City, and her third, Harriet, on the Jordan River in 1852. They later moved to Lehi”. 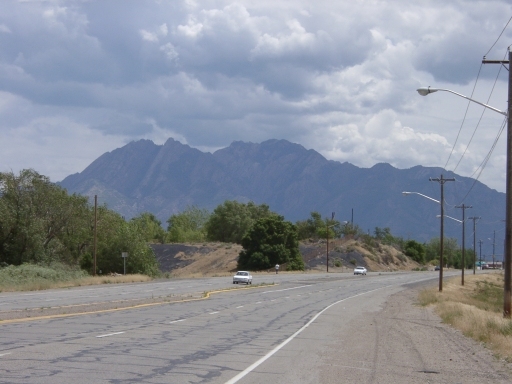 Looking east from a position between the river and the hill, from the south side of the road that runs east and west through Midvale and West Jordan. © Copyright 2001, Robert Raymond. Looking west towards the Jordan from a location just north of the road that runs east and west from Midvale to West Jordan, about midway between the river and the hill. This photograph was taken in 2001 and retouched to show how the scene might have looked in 1852. “Among the first settlers who located in the district later comprised in Midvale Ward was David Pettigrew of the Mormon Battalion, who together with Alonzo and Wallace Raymond and their families, settled in 1851 on the east side of the Jordan River, about a mile west of the present Midvale 1st Ward meeting house. They were followed in the fall of 1852 by Harmon and Royal Cutler and William Bird with their families”. “ Among the first settlers who located in that district of country now included in Midvale were David and Emily Pettigrew who, together with Alonzo and Clarinda Raymond and several children settled on the east side of the River Jordan between the river and the hill on the east at a point about one mile west of the present Midvale First Ward meeting house and immediately north of the road that runs east and west through Midvale and West Jordan. The river forms the boundary line between the two towns. According to the best recollections of the earliest settlers, the Pettigrews and the Raymonds were the only families who spent the winter of 1851-1852 in the Jordan River Valley east of the Jordan River. In the fall of 1852, Royal and Harmon Cutler with their families settled near the Pettigrews and Raymonds on the same side of the river. The Harmon Cutlers were among the Mormon exiles who were forced away from Nauvoo, Illinois by the mobs in the year 1846. They came west as far as Council Bluffs where they remained until the summer of 1852 when they started for Salt Lake Valley. On their arrival they settled on the Jordan River. Harmon Cutler's wife was Lucy and Royal Cutler's wife - Theda. With them came Josiah Arnold. Another early settler was William Bird who with his wife, Eliza, located near the first settlers mentioned on the east side of the river”. Alonzo and Clarinda moved to Lehi sometime before 21 May 1854. They had a child, Lydia, born there on that date. Alonzo received a second Patriarchal Blessing while living in Lehi, Utah. He received his first one in Nauvoo on April 28, 1845. (See footnote # 4) This one was given by John Young on Feb. 9, 1860. Feb. 9, 1860 Patriarchal Blessing given at Lehi, Feb. 9, 1860 by John Young, upon the head of Alonzo P. Raymond, born Feb 14, 1821 in (Bristol) Addison County, Vermont. Numerous Lehi men in the late 1850's and 1860's volunteered to assist in various Indian engagements and to help immigration efforts into the territory. Early on the morning of 8 March 1858 the rapid beating of the community signal drum called Lehi men to the Meeting House. Volunteers were requested to rescue embattled Mormon colonists at Fort Limhi on the Salmon River in Idaho. One man who was there and volunteered was George Barber. Alonzo and Clarinda had a child, “Louisa”, born in Lehi 18 Jan 1860 but it was blessed in Smithfield, Cache, Utah 15 Jan 1861. Elders Hyde and Benson called at the Historian's office and T. Bullock wrote an account of their mission to the northern settlement to be published in the Deseret News. “There are 150 families now in the different settlements in Cache Valley and others are going daily. 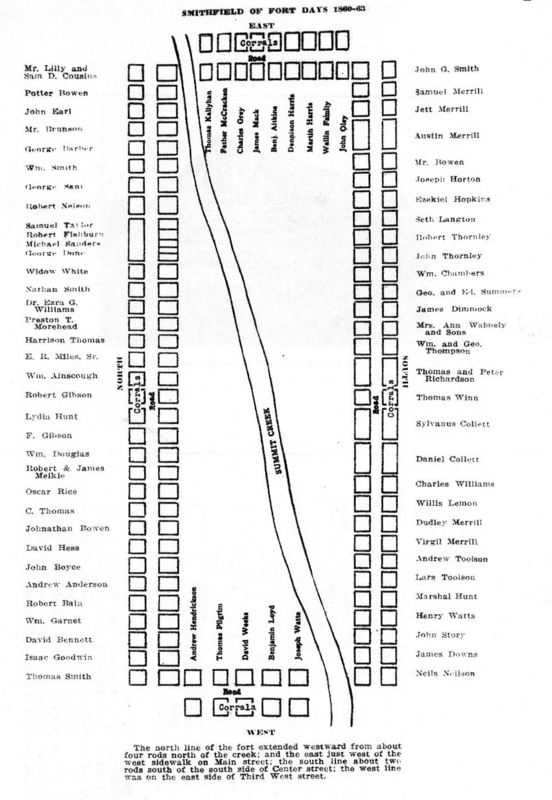 Elders Hyde and Benson organized a stake with six branches in Cache Valley and gave names to different settlements. On their return they preached in all the settlements from Brigham City to Great Salt Lake City; also held conference in Ogden City with John Taylor and Lorenzo Snow. On Tuesday the 10th (November 1859) at about 11 o>’clock a.m. pursuant to instructions received from the Presidency of the Church, we proceeded to Cache valley, seventy five miles north to organize the settlements. A president was duly elected by the people, to preside over all the branches and Wards in that valley. Six Bishops were also ordained and set apart to act in their calling, in their several Wards. Twelve men were elected by the people to form a High Council and were set apart to their office. A proportionate number from each Ward was elected by the people of those Wards, that an equal representation might be given in the High Council, as nearly as we could ascertain. We labored faithfully in every settlement. The place heretofore known as Maughan’s Fort we named Wellsville. Spring Creek settlement being situated in an elbow of the mountains and appearing to us somewhat of a providential place, we named Providence. The next settlement northward had been previously named Logan. The settlement on Summit Creek six miles north of Logan we named Smithfield, and told the people there to be spiritually what their location really was- a city on a hill, that could not be hid. For beauty of landscape and richness of soil, Cache Valley can hardly be equaled; yet its altitude being considerably greater than that of Great Salt Lake Valley, renders it liable to deep snows and severe frosts, which may admonish the settlers there to provide plenty of forage and sheds, barns, etc. for the preservation of their stock. “What to say in a short time when so many ideas present themselves, is somewhat difficult to decide. How many have moved here this spring, I know not. Some have gone to Carson Valley, and a great many have come here. And, as I told the brethren last night, a part did not seem to care much, if at all, which way they went, and had written on their wagons “To Carson or Cache Valley, we don't care a d--n which” Are such satisfied with themselves? No, nor with anything nor anybody around them. We have come to pay you a visit for we wanted again to see Cache Valley. ... We wished to see you and to have you look at us. Do you think we are Mormons? “Yes!” Some of you saw me and others of the brethren in England and what do you think of us today? Do we talk to you as we did in other countries? Is Mormonism as good to me as it was then? “Yes!” And every year I am in it, it is better, because I learn and understand more of the dealings of the Lord with his children on the earth; more of the design in the organization of the earth, in its being peopled, and what the Lord intends concerning its future. All these things are before us. I will not detain you, for I purposed speaking but a short time, to tell you that I feel as well as I ever have. My spirit is full of joy and comfort, and I feel to bless you all the time, and to pray for you continually, and day by day to bear you in my faith before my Father in Heaven. “The sisters have requested me to tell them how we lived and what we did here when Smithfield was first settled. I will do the best I can, after so many years have passed. In the spring of 1860 a good many more settlers came here from different parts of Utah and there was a ward organized with John G. Smith as Bishop and Samuel & Dudley Merrill as councilors; thus the name of Smithfield was given in honor of the first Bishop. We were all camped close together; four rows of wagons. We did our cooking, such as we had, by campfires outside of the wagons. We camped in this way for over two weeks and the Indians did not come back. However, the men all took turns guarding the camp both day and night. Typical Pioneer Home of Fort Days. We had to make our own soap out of animal fat and ashes from the fireplace. We had to carry our water from the creek as there was no water works at that time. Thomas Richardson & William Douglas were the first to start a store in Smithfield. That was a great blessing to the people here. The following is taken from a history of Alonzo P. Raymond written by Helen Price Hyde of Bannock, Idaho. “In 1854 the Raymond family was living in Lehi, Utah, where Alonzo P. was fence supervisor and inspector. Here, four children were born: Lydia - 21 Mar 1854, Alonzo - 24 Oct 1857, Louisa - 18 Jan 1860 and James - Sep 1862. Lydia lived only a few years. At the time or shortly after the birth of James, mother Clarinda passed away. James died in infancy. Clarinda died 24 Sept 1862 and was buried in Smithfield, Utah. In 1860 Alonzo Pearce Raymond became interested in the progress of Cache valley. He bought a home in the Smithfield Fort[41a] from a Mr. Brunson and also Brunson's interest in the saw-mill. In 1863 Alonzo owned and operated a shingle mill and was a partner in the grist mill. 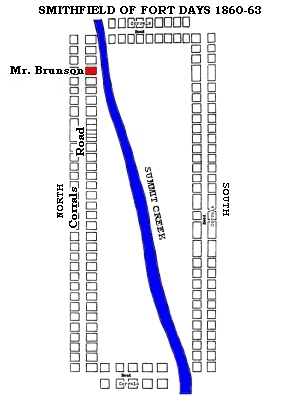 All these were located on Summit Creek, now called Smithfield Creek. In 1860 moved to Cache County and settled in Smithfield. Page 9 Apr 3rd 1861 Weather pleasant. Helping Alonzo Raymond haul brush; hunting a cow. Page 20 Sat. Aug 17th 1861 Hunting cattle in company with Alonzo P. Raymond. In the afternoon watering corn and potatoes. Sun. Sept 1, 1861 Weather cool. Attended meeting in the forenoon and in the evening in company with Alonzo P. Raymond (and others) went down to Hyde Park on business. Sat. Oct 12, 1861. Got several Shoshone Indian squaws to help dig potatoes. Dug and hauled 30 bushel. Page 26 Thurs. Oct 31. Traveled to Plain City and put up with Wallace Raymond. Found Alonzo P. Raymond there waiting for me to help him drive his sheep home. Fri. Nov 1, 1861. In company with Alonzo, went down to Salt Creek about three miles distance and gathered up about 10 bushel of nice salt. Sun. Nov 3rd 1861 Cloudy and cool. Had considerable trouble to find my cattle this morning which detained me some time. Got to within about 3 miles ol Logan and encammpt about 7 p.m. Had to watch the sheep until about an hour before daylight and found all well. Employed today unloading, etc. Page 30 Dec 25, 1861. Still stormy. This is Christmas Day and the prospects at presents are not very flattering for a Merry Christmas. My folks and Alonzo's got up an excellent dinner and invited a few friends to partake with us. About noon several of us concocted a plan to get a party at the school house. We succeeded and enjoyed ourselves about right until about 12:00 p.m. returning home highly gratified with our evenings amusements. Jan 1st 1862 Raining part of the day. My folks in connection with Sister Raymond got up a dinner and invited a few friends. We enjoyed ourselves first rate during the day and in the evening was pleasantly entertained at a New Years party at the school house. Mon. Jan 6th 1862 Foggy and cold. Separated my sheep from Alonzo's today. Working on a sleigh. Tues. Jan 20th, 1862 Louisa taken very sick today. Wed 21st. Administered to Louisa several times today. Sat. Jan 24th 1862 Louisa in much dread of her disease. Settled in her breast. Very painful. Baby Albert a little better. Thurs. 29th Jan 1862 Louisa's breast lanced by Dr. Williams. Little Albert still very weak. Mon. Feb. 24th 1862 Anxiously watched over little Albert all night. Fully realizing the feeling on an anguished parent over their dying child ...Morning dawns and our beloved child is still no better. We plead to our Heavenly Father who can still raise him up. Fri. Mar 28th. At 11:00 p.m. he breathed his last. This I can truly say was a relief as his suffering was now over and his soul is at rest. Page 44 Sat. Apr 5th 1862 Weather pleasant. Sent my cattle home with the Smithfield herd and hunted over the range 'till about noon for Alonzo's stock. Found 2 head and returned with them about sundown. Page 56 Tues. Sept 23rd, 1862 Sis. Raymond (Clarinda Cutler Raymond) taken sick last night. Her life is despaired of this morning. Rode to Logan to get Dr. Dilly to assist Dr. Williams in a surgical operation on Sis. Raymond but could not prevail upon him to come. Returned and Sis. Raymond had delivered a still-born child which had to be taken by force. Page 57 Thurs. Sept 25th 1862 Cool and cloudy Busy all day arranging for the funeral which took place about sunset. Page 60 Sat 8th Nov 1862 Weather pleasant ...Loaded up 1000 feet of lumber (to trade for salt) and got ready to start down to Plain city. Adeline arrived home about 3 p.m. from Lehi and was heartily welcomed by us all having been away on a visit about six weeks. Started about 12 p.m. for Plain City. Tues 11th Nov 1862... Exchanged my lumber for salt which is much needed in the settlement. Loaded up and got ready to take an early start for home. Thurs. 13th Weather cool Reached home about noon. For Mayor - George Barber; for Councillors - Andrew A. Anderson, Preston T. Moorehead, Alonzo P. Raymond, Robert Pope and Edmund Homer; for Justices of the Peace - Jeremiah Hatch and Andrew J. McCombs. The above persons were put before the meeting singly and sustained by vote to be elected at the next election. Persuant to special notice of the Hon. William Hyde, Judge Probate for the County of Cache, Utah Territory, and in accordance with an act of the Territorial Legislator, approved February 6th A.D. 1868, an election was held May 20th A.D. 1868, for the purpose of electing municipal officers under the charter for the city of Smithfield. June 8, 1868 Monday evening, the Mayor elect and members of the city council, for the City Smithfield, Cache County, Utah Territory met at the house of George Barber in said city, for the purpose of consumating the municipal organization of said city. PIONEER WOMAN TELEGRAPH OPERATOR DIES AT AGE OF 84. One of the first persons to operate a telegraph line in Utah, Susannah Raymond Homer, 84, wife of the late William H. Homer, Sr. died yesterday at 11 a.m. at the home of her daughter, Mrs. Rose H. Widstoe, 382 Wall Street. (Ogden, Ut.? ). 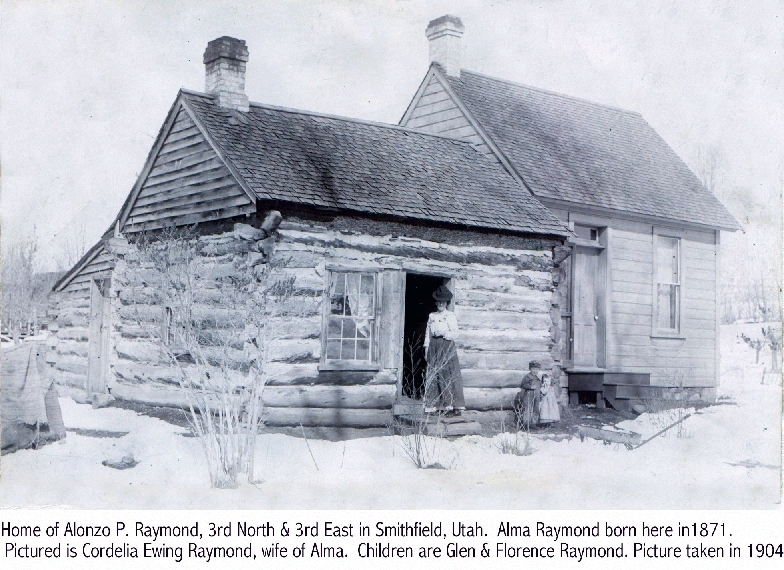 Born in Salt Lake City, Jan. 31, 1850, a daughter of Alonzo Pierce Raymond and Clarinda Cutler Raymond, Mrs. Homer had charge of the first telegraph station in Cache Valley. She and her husband celebrated their 63rd wedding anniversary, Feb. 28, 1933. Mr. Homer died in January of this year. 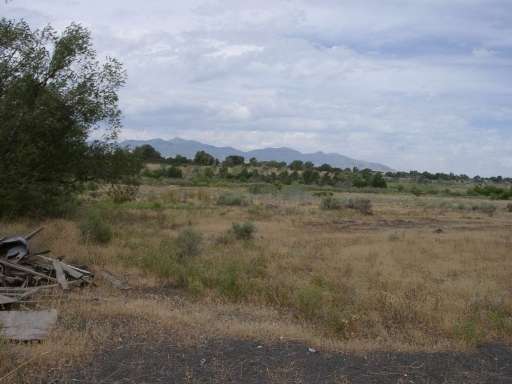 Alonzo bought 20 acres from his wife, Elizabeth Hillyard. This is a copy of the deed with his signature on it. Original deed is in possession of Cleve Raymond. Certificate filled out by Alonzo P. Raymond when he was 78 years old. Elizabeth Hillyard Thompson, a widow, in 1869. Alonzo and Zilphia were the parents of 12 children, eight boys and 4 girls. The names and birth dates are as follows: William Goodwin - May 1864, Ephraim - Jul 1866, Zilphia Clarinda - Sep 1868, Laura Pricilla - Sep 1870, Perris - Dec 1872, Abigail - Aug 1874, Wallace - Jan 1877, Aquilla- Aug 1879, Mary Ann - Mar 1882, Sylvanus (twin) Oct 1884, Sylvester (twin) Oct 1884, Frank Lester- May 1887. Alonzo and Elizabeth Hillyard Thompson had two children , Zilphia Amelia - Mar 1869, and Alma - 3 Jun 1871. Alonzo died on 14 Aug 1904 and is buried in the Smithfield, Utah Cemetery. Patriarchal blessing given by John Smith, Patriarch on April 28, 1845. Recorded in Vol. 9, p. 107 page 337 of typescript. Nauvoo Temple Endowment Register - Fourth Company - February 7, 1846. Members of the Mormon Battalion received uniform allowance plus $3.00 per day. Pearis Raymond was Alonzo's father. Pearis died the next month, September 1846, near Mosquito Creek. He probably died of malaria. Clarissa (Clarinda) Cutler was Alonzo's wife. She is the daughter of Harmon and Lucy Ann Cutler and granddaughter of David and Elizabeth Pettigrew. Clarissa, (Clarinda) was born 9 Jan 1827 in Oswego, Amboy, N.Y. She was sealed to Alonzo in Nauvoo Temple on 7 Feb 1846 and died in Smithfield, Cache, Utah on 24 Sep 1862. Elizabeth Pettigrew was the wife of David Pettigrew who served in Company E of the Mormon Battalion. David was the battalion chaplain and at the age of 55 was the oldest member of the battalion. As previously mentioned, Alonzo married Elizabeth's granddaughter, Clarinda Cutler. Elizabeth was asking $40.00 instead of $20.00 because her husband, David, and her son, James Phineas, were both serving in the battalion. James served in Company D along with Alonzo P. Raymond. I think they took the money because she and Clarinda were planning on staying in Council Bluffs until their husbands returned from the battalion march to get them. Harmon Cutler was Elizabeth Pettigrew's son-in-law, having married Elizabeth's daughter, Lucy Ann Pettigrew. Harmon was Alonzo's father-in-law. Reference Book for Nauvoo Family History and Property Identification pp. 225, 226. Listed as “West Jordan, UT”, but was in Midvale, Utah, on the border between towns. William Wallace Raymond was Alonzo's brother. He was born in Bristol, Addison Vermont on 26 Mar 1824. (Three years younger than Alonzo.) He married Clarinda Cutler's sister, Almira, on 6 Dec 1848 in Council Bluffs, Iowa. Remember, Clarinda is Alonzo's wife. Wallace and Almira had twins born on the Loup Fork River in Nebraska on 12 Jul 1852. They had a son, William Wallace Jr. born 28 Mar 1854 in Lehi, Utah. They then had a child, Almira , Born 13 Nov 1856 in Plain City, Weber, Utah, where they stayed. Patriarchal Blessing given by John Young to Alonzo P. Raymond on Feb. 9, 1860. Recorded in Vol. 27, p. 767 and signed by John U. Long reporter and L.A. Long, Recorder. George Barber married Louisa Elizabeth Raymond. She was Alonzo's sister. George and Louisa got married on 26 Jan 1855 in Salt Lake city. They had a child born in Greenriver, Wyoming in 1857 and then one born in Lehi, Utah in 1859. History of Alonzo P. Raymond, written by Helen Price Hyde in Jan. 1967, of Bannock, Idaho. It is on file with the Daughters of Utah Pioneers Museum in Salt Lake City, Utah. Cleve Raymond has a copy of it. [41a]The map of the Smithfield fort and the picture of a typical house in the fort are from History of Smithfield, written by Leonard Olson in 1927. Notes from George Barber Diary. Original in Joel E. Ricks Collection, Vol. 5 at USU in Logan, Utah. George Barber married Louisa Elizabeth Raymond 26 Jan 1855 in Salt Lake City. Louisa was Alonzo's sister. Alma Raymond was born 3 Jun 1871. He was the father of Wickliff Clayton Raymond who was the father of Cleve A. Raymond. Record of Members of Smithfield First Ward - Early to 1877, Film # 0025611 in FHL in SLC, Ut.